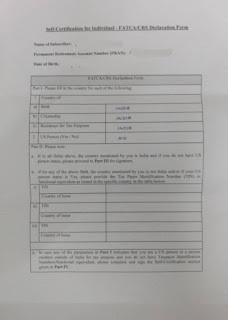 Worried about the email received from NPS Trust(National Pension Scheme) asking you to submit self certification of declaration form for your PRAN (Permanent Retirement Account Number)? The email even says your account will get blocked temporarily from 1st of May 2017 if the declaration is not submitted by 30th of April 2017. Don't get panic, financial institutions in India have to obtain self-certification from all bank, mutual fund and pension scheme account holders whose accounts were opened on or after July 1, 2014 and have to do a due diligence as part of Income Tax Rules. You are advised to submit the declaration form at the earliest so that your account is compliance with the local laws. If you don't have NPS account, you can open one online, read Opening NPS account online - Step by step guide. FATCA stands for Foreign Account Tax Compliance Act, under Rules 114F to 114H notified under section 285BA vide Notification No. S.O. 2155 (E) dated 7 August 2015, all accounts opened on or after July 1, 2014 needs to submit a declaration form which is needed as per anti-tax-evasion agreement between US and India. This agreement allows Indian and US governments exchange information which will help in detection of unaccounted money held by Indians in US or vice versa. 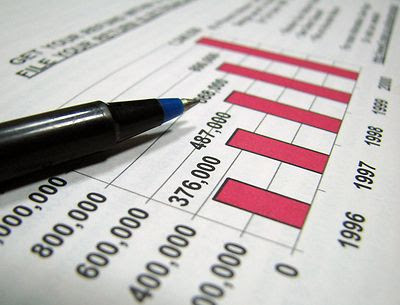 How to fill FATCA form? First download the self declaration form from this link, and take a print(select two sided printing option, let's save some trees!). It is unfortunate that in this digital age, NSDL is asking for a physical form to be submitted instead of online form. On the first page enter your full name, PRAN and date of birth. Now fill part I which would be INDIA, INDIA, INDIA, NO in order for normal account holders in India. Others, fill the form as per your residential and citizenship status. 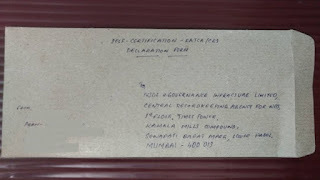 Normal account holders in India can now skip to part III, at the bottom of the page put your signature, name and date of filing the declaration form. You don't need to fill part IV nor submit address proof if you are a citizen of India and holding a normal account. 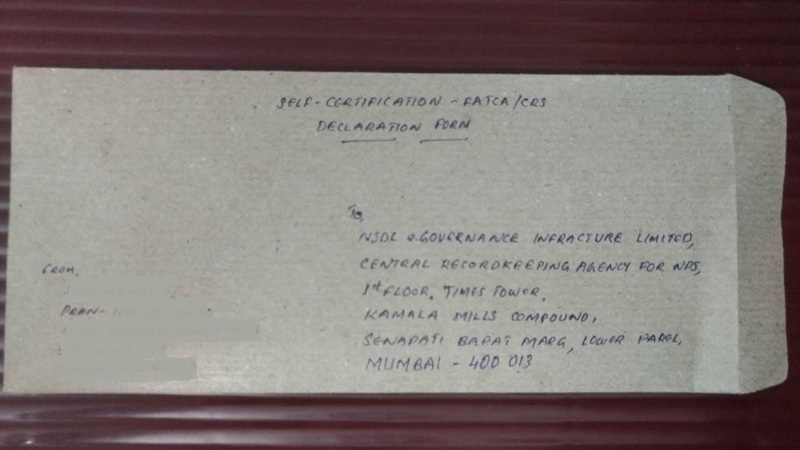 Also make sure to write "Self-Certification - FATCA/CRS Declaration Form" on the top of the envelope. Send the form via normal or speed post and you are done with the process. Now sit and relax, NSDL will update your records on receipt of your form. Also they will unblock your account if it was blocked due to non-submission of the FATCA self-certification declaration form. 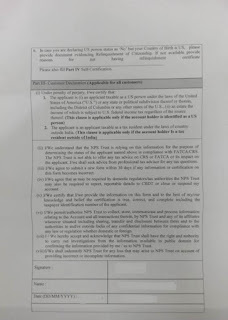 FATCA procedure is same for NPS, Atal Pension Yojana(APY) and other similar accounts, the form format may vary, please contact your account keeping agency or refer the email received from the authority. 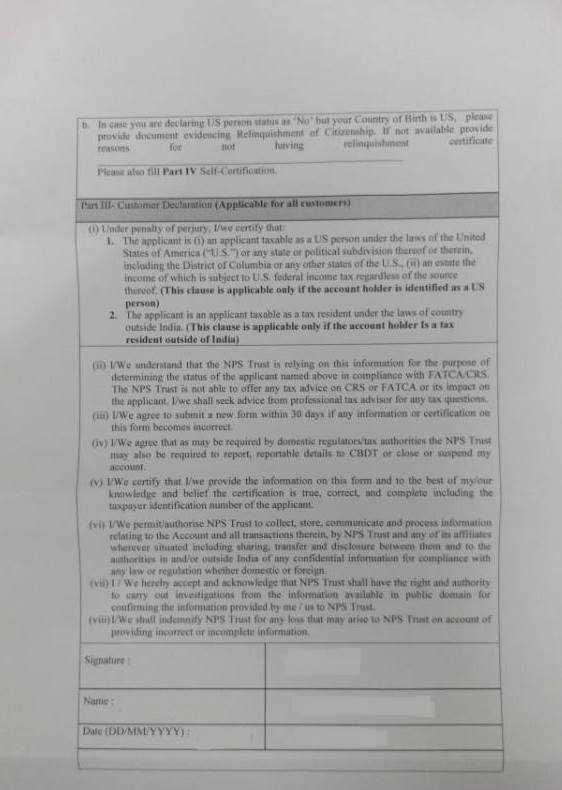 On May 3rd NSDL sent a message to all NPS subscribers a letter stating their account will not be blocked due to non-submission of FATCA Self-Certification. A revised guidelines will be issues shortly, stay tuned. 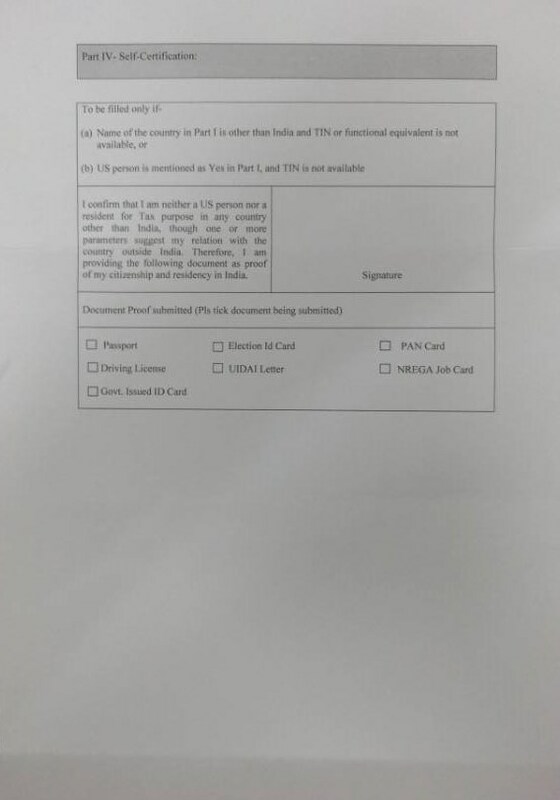 As per the latest instruction received from PFRDA/NPS Trust, PRAN would not be blocked on account of non-submission of FATCA Self-Certification. PFRDA / NPS Trust will issue revised guidelines on FATCA shortly. 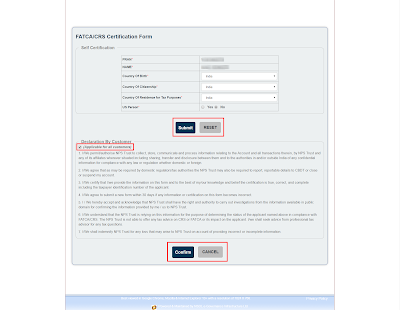 Now you can submit FATCA Self-certification declaration form online. On 25th of May, NPS Trust sent an email to all subscribers describing the steps to fill and submit the declaration form online. A sub-menu FATCA Self-Certification was been added under the menu Transaction. The form is pre-populated with account details, the subscriber just need to click on the "Submit" button and then check the declaration under "Applicable for all customers", finally submit the form. An OTP will be generated and sent to your registered mobile number, enter the OTP and you are done. An acknowledgement Id will be given for the submission, save it for future reference. 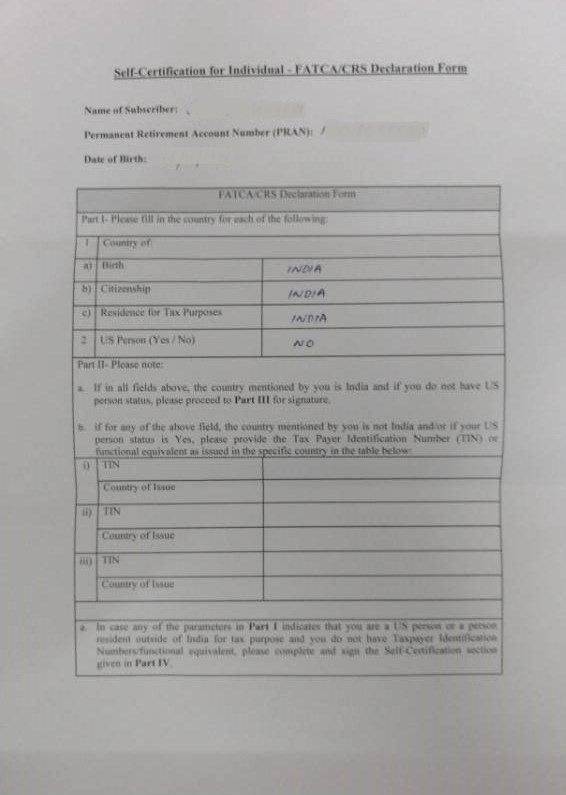 As per the latest instructions, you need to submit physical copy only if your Birth Place, Citizenship and Residence for the Tax Purposes is other than India or you are US citizen. when i checked my FATCA in my account it showed already done. Do i have to send the self declaration again. I did it online logging in my account. How does one submit FATCA declaration for one's Atal Pension Yojana related PRAN#? As for that there is no NPS login per se? Yes, i have same question also when i called APY Toll Free there said its not mandatory.